As well as our Top 100 tunes of the year that we’ve posted over the past few days, each of the MM contributors have put together their own lists. Today it is the turn of Mrs Mackerel. Love the piano on this song and the catchy, sing-a-long chorus – a guaranteed earworm if I had any (ears that is… being a fish, of course.) Steve Mason’s gentle vocals reflect on love lost and the hope of finding it again. I’m loving the piano this year and there’s a good bit of gutsy playing here. What were we hoping to get out of this boys? Nothing actually. People are so bloody disappointing aren’t they? Sold to me in wistful and reflective mode; there’s more than a kernal of truth in these insightful lyrics: You realise it’s just a whim/And you notice it matters/Who and what you let under your skin. Here are my shoes. See how I gaze at them. It says 2013 on the label, but I’ve gone back to the early 90s. Lovely. It’s the lazy, laconic drawl and the finger-clicking rhythm – just one hand if you’re me, as the other doesn’t seem to work – and the way you can sing along to ‘No destruct-shaan’ quite happily, even in modest company. Oh clever, clever Nicholas Cave and his voice so hypnotic, deep and dark. You could imagine this as part of a recruitment drive to join a cult (yes you, with your wide lovely eyes). With a teasing yet subdued musical arrangement, this is the gospel according to St Nick. The bass drum kicks this one into action, then a little bit of clapping and the rest of the band follows. There’s a sweet change of tempo for the chorus: ‘And the memories we made will never be lost, no.’ Maybe not with the ink, pens, and prevailing wind and all that shaking. We are right in the mix here: a bit of dance therapy needed. Remember the hypnotic triangle of cooker/fridge/sink? Throw some shapes, make a curry, go knock yourself out; I didn’t want to dance, but they made me. There’s menace and a brooding darkness in this devil’s resting place as LM returns to the pared back sound of Alas I Cannot Swim. But there are many layers to this music and her latest album has an intensity and intelligence that means she’s still my number one gal. Cowboys! Gunfight! This is an upbeat folky number with a wicked drum backbeat that pulls it all together like a rolling canter. He’s a bad ‘un and it’s a shame. The rhythmic drumming and finger picking guitar counter balance Katie Crutchfield’s rich, husky vocal in this short, melancholic lament: you hold on to the past, you make yourself miserable/and I’m ruled by seasons and sadness that’s inexplicable. So there. Yes, it’s a Bruce Springsteen cover, but quite frankly, so what? This is a damn fine tune and that’s one hell of a Marlboro red voice she’s got there. And did I mention the piano (again)? Sharply observed lyrics float over a gently strummed backdrop, this song is plumbed from the emotional depths of her divorce album. Might not get you in the Christmas spirit but is sure to bring a lump to your throat. Pull up a chair, I wanna tell you a story about tormented man. To be honest, he’s too much trouble for me (cook your own bacon, change your own sheets boyo), but I like a good yarn and a telling verse: The mind is a place unto itself/ And in it makes a heaven of hell/And a hell of heaven. Quite. This one’s a bit of a swayer and despite the title, Cold Blood is lyrically beautiful and uplifting. You can drift into the rise and fall of the music and the harmonies – and, like the man says, we’ve got places to be and nothing to prove. I could rename this Southern Devon song: late July, lying on the beach with the waves rushing into my ears. Can you hear the cymbal tremor throughout this song? Nowhere seems the only place to go; aye, Captain. Tales from the battlefield: an unusual, almost discordant arrangement with sublime vocals. If I was looking for an influence, maybe a hint of Kate Bush? Quite unique and utterly brilliant. Matthew Houck’s ragged voice was not always to my taste. But time has altered us both and it’s his strong yet fragile vocals that stitch together Zula’s imagery, which cuts far and deep. Intensely poignant lyrics, sweeping strings, pulsing drum machine: it all weaves together to form an emotional testament to the end of a relationship. Ever had your heart broken? This is what it feels like. What’s a five mile trip to school without a bit of crooning about a hobo? It’s just me and the littlest Sprat in the Minner now and it’s often a power struggle over the play list. Joe, you win: your sing-along to this is top banana. Fab acoustics and great sound, and, of course, the warm-up for his Muchacho tour. For me, there was no finer album of 2013. Perfect. If I had to explain, you wouldn’t understand. Weather Codes, the superb new album from Texan songstress Teresa Maldonado aka Georgia’s Horse, comes out today on Fire Records. It is a brilliantly eclectic collection ranging from sparse and spooky country noir to psych-folk and touching all points in between. The backdrop throughout is the baking heat and vast landscapes of Texas and the American Southwest – sometimes lonely, sometimes menacing, but always fascinating – Weather Codes is a journey to be undertaken with eyes, and ears, wide open. We have previously given you Ginger from the album, now try the hypnotic and plaintive melancholy of Thistlebomb. 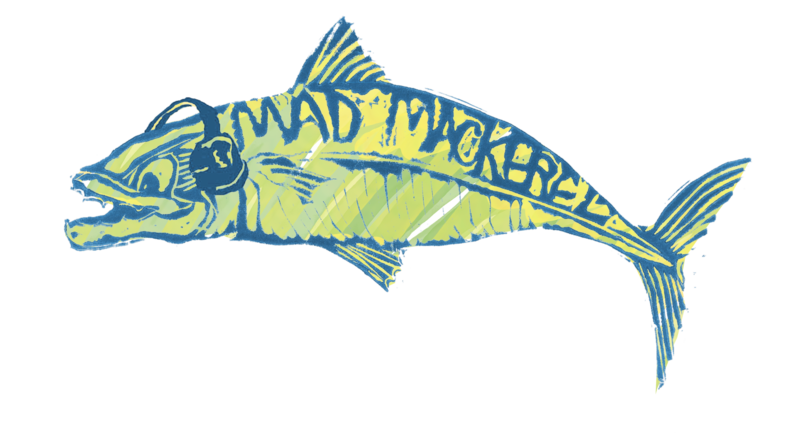 Read her 5:1 Interview with Mad Mackerel here. Descriptors such as haunting, enchanting and, indeed, heartbreaking occur often, but for Georgia’s Horse they are particularly apt. Her debut release The Mammoth Sessions was a triumph of eerie, gothic tinged, dark country and the follow up manages to raise the bar even higher. It is still a record for night owls certainly, the eeriness is still there, with a sorrowful melancholia never far from the surface either – the perfect accompaniment to drowning sorrows with a decent bottle of liquor. Weather Codes is a record with its roots in the landscapes and stories of small-town Texas, where the inhabitants live out their hopes and fears and mistakes in perfectly judged vignettes of love, loss and despair. Read on to discover where cod and lemon, Orson Welles and Angola Prison Spirituals fit into her 5:1 Interview. The Elephant Vanishes – This was my first introduction to Haruki Murakami. I am forever indebted to Meti, my dear friend, for knowing me well enough to insist I read it. I have a deeper requested moment, but for the sake of keeping it short, I’ll confess this. I remember my dad telling us the story about the Orson Welles radio broadcast of War of The Worlds. Not that he was around then at that time either. It struck a chord with me because when I was younger, I had huge irrational fears of these types of things happening. Invasions. Not so much aliens. Just invasions in general. I wondered how it would feel to actually have heard that on the radio. Mick Collins – I would have so much fun playing with him. I mean really letting go. Marian Anderson – Somewhere. Someday. Loading in/out of absolutely all equipment. I hate this part. I would most likely rather go alone. But I would want a small moment with my family and my love to say goodbye. To say that I’m sorry I have to leave. But then, yes, I’d rather be alone. One Song…Mammoth. A cautionary tale for all the kiddies. Pre-order Weather Codes from Fire Records here. Check the side bar for our other 5:1 Interviews. The brilliant debut album The Mammoth Sessions by Georgia’s Horse was a big hit round these parts. Mrs M in particular loved the mysterious, haunting vocals of Texan songwriter Teresa Maidonado set over a backdrop of swirling, dusty Americana and old-time folk. It was gorgeous, mesmerising and unsettling in equal measure and as fine a debut record as you were likely to hear. Her new album Weather Codes will emerge blinking into the light of day on the 25th June courtesy of the mighty fine Fire Records. Consisting of fourteen tracks written during a failing relationship, they are shot through with a melancholy and sadness that is almost real enough to touch. This is a record to spend time with, to wallow in and to absorb until every nuance is revealed. A record for the forlorn and the forgotten, the lonely and the sorrowful, and for those needing to find comfort or solace from their own heartbreak in the middle of the night when the darkness is blacker than ever and daybreak feels as if it will never come. Weather Codes draws on influences ranging from the vast open spaces of Texas and it’s parched, unforgiving sun to the struggles of coping with small-town gossip and game-playing via musical touchpoints that include the fractured psych-folk of Bonnie ‘Prince’ Billy, the black metal of Venom and the dark gothic undertones of Bauhaus. We’ve just listened to it a couple of times so far, but have no fear, the result is something wonderful – evocative, poignant, sometimes unnerving, but always magical. Download Ginger below, and put this album to the top of your “must-have’ list. After a rather merry dinner with friends (piscine and other) last weekend, which saw us on the sloe gin and sporting false moustaches, this week has been less cheery. I think I’ve got a nasty case of rising damp. I know it sounds as if a visit to the Tena Lady shelf of the chemist might be in order, but there’s nothing wrong with my plumbing. It’s the weather. It has seeped into my bones. We seem to have skipped Autumn altogether and gone straight to Winter without passing Go. It’s dark and gloomy and cold and it hasn’t stopped raining for five days. Actually, talking of waterworks, there is a leakage problem at The Temple. The boiler at St. Urt’s has gone on the blink, so we huddle round the gas fire in the evening and try to dry out. If that isn’t bad enough, I have been working all week on web copy for a tour company. Holidays in the sunshine. The stuff of summer dreams, while I have been wearing tights and an extra cardi. There is still no sign of the plumber and the rain is set to continue indefinitely. Me’ cockles are in dire need of some warming. Bring me fun, bring me sunshine, bring me love. And hot water and working radiators. You may also wish to investigate HP’s own, rather marvellous, blog How to be a Happy Housewife. This week, in sunny Charlbury, smallest sprat took a tumble down the rather steep Victorian stairs. Running to his rescue, I had, at that precise moment, chosen to gargle with some mouthwash. Cheeks bulging, I picked him up, caught the (cobwebbed) ironing board in danger of falling on him, then sprinted upstairs to expel said mouthwash. Sadly, I did this in such haste and with such force that it shot into the basin and promptly bounced back and hit me in the eye. Clutching my weeping eye, I descended the stairs to comfort sobbing Joe, trying not to sob myself. Some little time later, I’m sat (with reddening eye) in the local hostelry waiting for Big Sair. It was empty. I’d booked a table. No-one else had booked a table. Big Sair came in went to the bar asked for a table booked under my surname (Mackerel, of course), they sent her away. I had of course booked it in my first name (Mrs). Big Sair leaves local hostelry thinking Mrs M is absent/late/fallen in the river. Cue lots of door swinging, which is all I can hear from my lonely table tucked away in the corner for sad cows. Meanwhile, Big Sair goes to another pub, my home, back to the pub I’m in… Farce? Blimey in a town with a population of less than 4,000, I was lucky to ever see her again. Long ago, in a far away land called Oxford, I first met MM. I used to go to sleep very late to this album by (the perhaps appropriately named) Therapy? I don’t think MM or my flatmate found it particularly restful, but at least MM found it quite endearing. For a while. And it only seems fair that after her great endeavours to find me that I dedicate a song to Big Sair this week. As It Stops Raining is by Georgia’s Horse, at the opposite end of the musical spectrum to its predecessor. Perhaps if we’d contacted Georgia and used her nag, we might have found each other slightly more quickly. It’s just a thought.